Here it is, Tuesday again, and we are all Christmassy. Thanks this week go to Nadolny, Dustin, Wifey, Atmikha, and Peefer. 1. Do you put up a tree? If so, do you have a tradition on how you hunt, kill and return the tree home? Our home is all treed up. We have our Christmas tree in the dining room this year. It is in the back corner and overflowing with Little Man presents. 2. If you could “buy” a positive personality trait for Christmas, what one would you get for yourself? Wifey? Little man? 3. Do you have the same types of food for your Christmas each year? Oh, most definitely! We are food obsessed traditionalists. On Christmas Eve we typically have a shrimp dish that is oooooh sooo tastey, for Christmas morning we have Cinnamon Rolls, and for Christmas dinner I will refer you to Question 8. 4. What have you decided to tell or not tell Little Man about Santa? We are firm believers in lying to our child to get him to behave better for small amounts of time. If a story of an immortal fat guy living on the Arctic polar ice sheet with a bunch of elves who make toys will keep him in line, then of course we use it. Just like we use Magnur, the Summer Solstice troll to keep him in line for most of May and June. Really, we play up Santa to him, but since he knows (and we constantly reassure him) that he is a good boy, we do not lord it over him. Train stuff will be the bulk of his Christmas gifts, but we do try to get him interested in other toys as well. There are these magnetic toys we are trying to get him interested in. It is a fruitless hope, but still a hope. 6. Does your family drink egg nog? With Little Man being allergic to eggs, nope. 7. Gifts on Christmas Eve or Christmas Morning? We give 1 gift on Christmas Eve, and it is always pajamas. They are the special Christmas Pajamas for the year. The rest of the presents are opened infuriatingly late on Christmas Morning. 8. Ham or Turkey for Christmas dinner? For Christmas Dinner we have a standing rib roast. Mmmmmmmm Beeeeeeef. It’s what’s for dinner. 9. Is their Christmas Caroling involved? Sweet mother of God, NO! 10. Do you set mistletoe traps in the house? 11. When your son comes back home from First Grade one day, looking shaken, and asks you if Santa Claus is true, what will you tell him? Oh, Magnur the Summer Solstice Troll, is going to be sooo unhappy! 12. Which claymation Christmas Specials best captures the True Spirit of Christmas? I like the story of Santa Claus one. Where Santa starts out as a svelte red-headed young man. Basically I like watching Santa age, it makes me feel better about my slower wasteline expansion. 13. How long has it been since you have tasted a Dolly Madison cupcake? 14. What is your earliest Christmas memory? I would sleep on my brother’s floor on Christmas Eve and we would stay up talking well into the wee hours of Christmas morning. He was typically the first person that I would say Merry Christmas to on Christmas Morning. 15. Which is your favorite of your mother's Christmas ornaments? Hmmmm… I imagine you are asking me which, of all the home-made ornaments I made for her, do I like most. Honestly, there is one that is framed in popsicle sticks with a pic of me when I was 4. 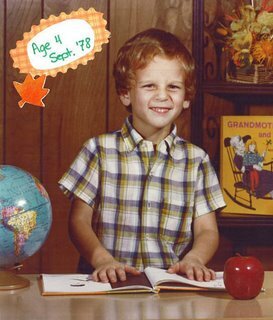 Yep, that's me at 4. That one makes me smile whenever I see it. 16. Why is there a tree in your house? Seriously: there is a TREE in your HOUSE. It's not even real. It's a synthetic representation of a tree in your house. Think about it. I believe the faux tree in my house is there to hold the Christmas tree lights. Duh, what else it is for? It is a delivery mechanism for small incandescent bulbs. Although the new LED lights ar4e pretty cool (from this geek’s perspective, not cool enough to purchase mind you, but cool nonetheless). 17. Caspar, Melchior, or Balthazar. Who is the most wise? 18. At what point in life did you realize that the manger is just an eating trough and not the whole A-frame shack? 19. What did Christ do after Christmas? You know, for the first twenty-five years or so. My bet is that until about 13 he exclusively annoyed the crap out of Mary and Joseph. After that, he was making cabinets and tables and annoying Mary and Joseph. 20. What is the farthest North you've traveled? Edinburgh, Scotland. That is the furthest north I have been. Capt. McArmypants and I were there in June, and it was light until about 11 pm. Crazy stuff. WTF?? Come on Weather. Get your act together!